App Tamer 2.0 is finally available, and the changes are pretty exciting. The user interface is faster and easier to use, both for checking on the performance of your Mac and for managing applications that are sucking up too much CPU time. And even more importantly, App Tamer can now slow down applications as well as stop them, so you can use it to reduce the CPU usage of some annoying applications even though those apps still need to work while they’re in the background. Think Spotlight, Mail, Time Machine – things that seem to randomly spike the processor usage on your computer, slowing down what you’re doing or making the fans suddenly roar like a Boeing 747. Tell App Tamer not to let Spotlight take more than 25% of your processor time and those CPU spikes magically go away! 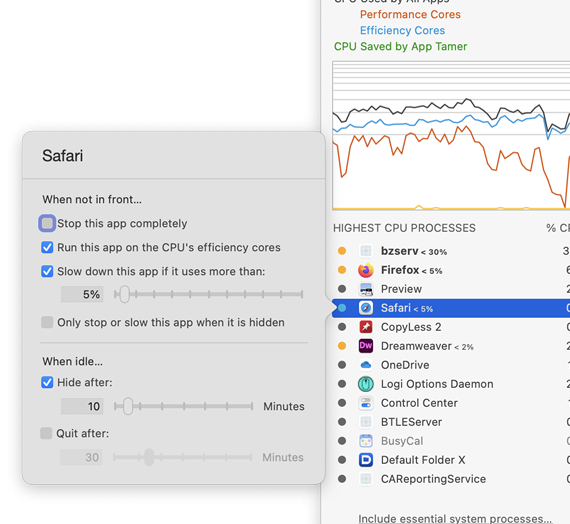 If your Mac’s fans are driving you crazy or your battery life is suffering at the hands of some self-important app that thinks it needs to hog the processor, grab App Tamer 2.0 and let it take care of it. Default Folder X 4.6.3 includes fixes for several problems, the biggest of which was the propensity for some applications (like InDesign, Pro Tools and Word) to start their Open or Save dialogs in the wrong folder. In addition, it gives Default Folder X’s SetSaveName AppleScript command the ability to understand UTF-8 text and fixes a bug that caused the popup path menu in Save dialogs to disappear in Mac OS 10.8.5. This version also works reliably on Mac OS 10.6.8 – though Snow Leopard users should be aware that it does not support PowerPC applications. If you’re still running old PowerPC apps in Rosetta, stick with Default Folder X 4.5.12. You can get the new version from the Default Folder X release page.